Larouat is an oasis , a small town in North Africa - in the middle of the Algerian desert. It is Hadji's Ahmed (Oud player and singer) hometown. 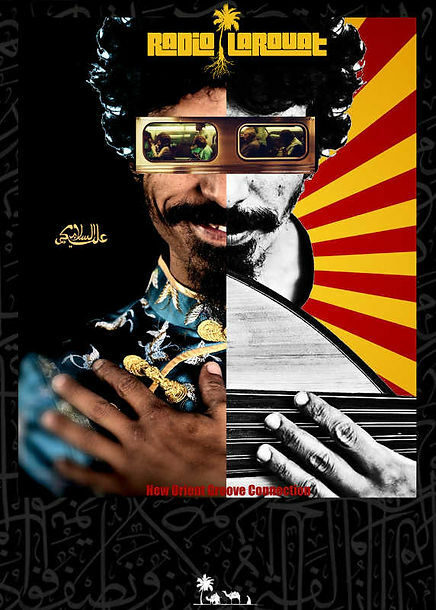 This is where Arabic music as well as African Polyrythmes characterizes his musical world . Radio Larouat combines these influences with funky drum grooves , Synthesizer sounds and vocal improvisations. The quartet developed his music in extensive improvisations in the rehearsal room . The improvisations are recorded , and from these wild , playful , gentle , beautiful , sad or just funny fragments developed the band's material for Radio Larouat . On stage the desert radio hits - a shimmering mix of danceable grooves , fantastic sounds , deep lyrics and surprising improvisations in a New Orient Groove Connection. Feel welcome to our Oasis.